Drywall Specialist Services A Large Area That Includes The Following Cities And Counties In North Carolina. Raleigh, Durham, Chapel Hill, Cary, Pittsboro, Siler City, Chatham County Plus The Following Cities & Counties. 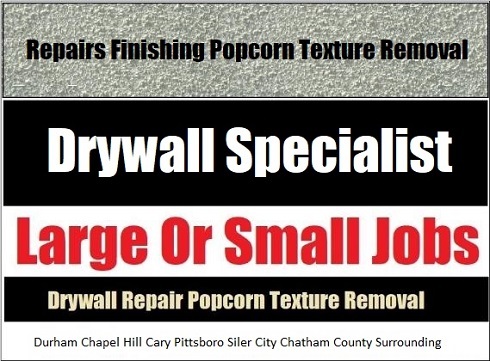 Drywall Specialist Service Area On Larger Drywall Installation, Finishing And Popcorn Texture Removal Jobs Includes All NC Areas. Smaller Jobs Like Hole, Crack Repair, small texture removal and blending work is Reserved For The Raleigh, Durham, Chapel Hill, Cary, Sanford, Burlinton, Asheboro, Pittsboro, Siler City, Chatham County Areas. can look like new when repaired by a professional contractor. Ask About Six Months To Pay Interest Free!